Oral bioavailability of dabigatran etexilate (Pradaxa(®) ) after co-medication with verapamil in healthy subjects. Br J Clin Pharmacol. 2013 Apr;75(4):1053-62. Impaired Rivaroxaban Clearance in Mild Renal Insufficiency With Verapamil Coadministration: Potential Implications for Bleeding Risk and Dose Selection. J Clin Pharmacol. 2018 Apr;58(4):533-540. Drug-drug interaction studies of cardiovascular drugs involving P-glycoprotein, an efflux transporter, on the pharmacokinetics of edoxaban, an oral factor Xa inhibitor. Am J Cardiovasc Drugs. 2013 Oct;13(5):331-42. 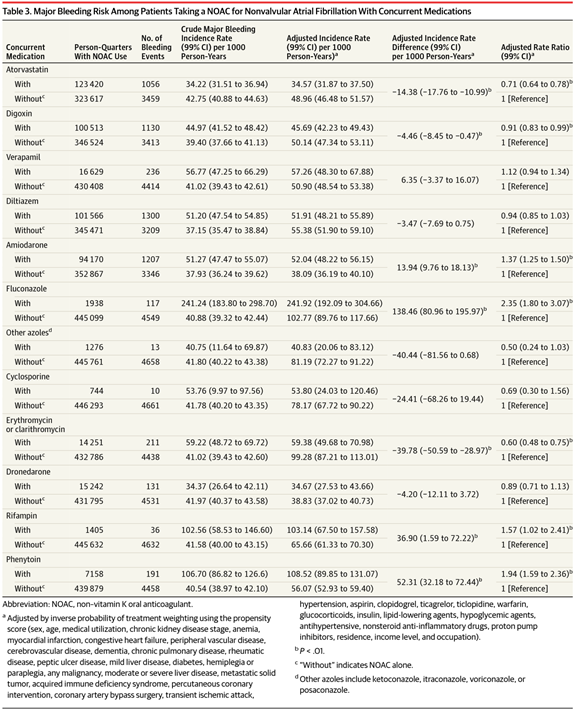 Association Between Use of Non-Vitamin K Oral Anticoagulants With and Without Concurrent Medications and Risk of Major Bleeding in Nonvalvular Atrial Fibrillation.